For other people named William Livingston, see William Livingston (disambiguation). William Livingston (November 30, 1723 – July 25, 1790) was an American politician who served as the Governor of New Jersey (1776–1790) during the American Revolutionary War and was a signer of the United States Constitution. Livingston was born in Albany in the Province of New York on November 30, 1723. He was the son of Philip Livingston (1686–1749), the 2nd Lord of Livingston Manor, and Catherine Van Brugh, the only child of Albany mayor Pieter Van Brugh (1666–1740). His older siblings included Robert Livingston (1708–1790), 3rd Lord of Livingston Manor, Peter Van Brugh Livingston (1710–1792), New York State Treasurer, and Philip Livingston (1716–1778), a member of the New York State Senate. Livingston received his early education from local schools and tutors. At age 13, Livingston was sent to live for a year and prepare for college with the Anglican missionary catechist and Yale College graduate Henry Barclay who lived among the Iroquois Indians in the Mohawk Valley at Fort Hunter. Livingston enrolled at Yale in 1737 and graduated in 1741. He went on to New York City, where he studied law and became a law clerk first for the eminent lawyer James Alexander. He left Alexander's office in the spring of 1746 before finishing his apprentiship due to some disagreement, and joined the office William Smith, Sr. He became a lawyer in 1748 and began his practice in New York City. In 1752, he founded a weekly journal, the Independent Reflector, along with fellow Presbyterian lawyers William Smith, Jr., the son of his law teacher, and John Morin Scott. The three were called by contemporaries "The Triumvirate". The Reflector was New York's first serial non-newspaper publication and the only one being published in British North America at the time. It was used as a platform by the political upstate Presbyterian landed "country faction" led by Livingston for challenging the powerful downstate Anglican and Dutch Reformed merchant or "popular faction" led by chief justice James De Lancey. Most notably the Triumvirate attacked the founding of King's College as a conspiracy by Anglicans to install a bishop in America, including his former tutor now Rev. Henry Barclay Rector of Trinity Church and his former law teacher James Alexander. Publication of the Reflector ceased with the fifty-second issue in late 1753 after political pressure was brought to bear upon its printer, James Parker, but Livingston and his allies continued to attack the college over the next year with columns in newspapers. By raising divisive issues of region, he managed to divert half the funds raised by a state lottery for the college to fund the construction of a new jail and a detention house for sailors from diseased ships. King's College was defiantly opened despite Livingston's efforts by President Rev. 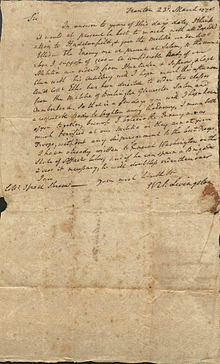 Samuel Johnson in July 1754, and granted a charter by the King on October 31, 1754. Though he failed to close the college, and no bishop arrived as predicted, Livingston remained politically active and served one term in the New York Assembly until his political allies lost power in 1769. In 1772, he moved to Elizabethtown (today Elizabeth, New Jersey), where he rented a house in town. A young Alexander Hamilton lived here with Livingston for at least the winter while he attended Francis Barber's grammar school. Livingston started construction of a large country home to house his growing family. The house, known as Liberty Hall, still stands today. 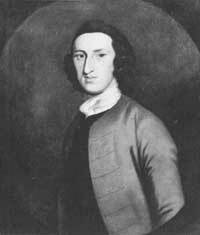 After attaining considerable influence amongst the local patriots, Livingston was elected to serve as one of New Jersey's delegates to the Continental Congress. He served from July 1774 to June 1776. The state's Provincial Congress declined to reappoint him to the Continental Congress as he did not favor independence. Instead, they offered him command of the state's militia, an offer he declined. Instead, he returned to New Jersey and relied on his previous commission (of October 1775) as a brigadier general of the New Jersey Militia. In August 1776, he was elected Governor of New Jersey. For much of the time between 1776 and 1779, the family was located in Parsippany for safety. Liberty Hall was frequently visited by British troops or naval forces since there was a substantial reward for Livingston's capture. One attempt to kidnap him took place in mid-June 1779. False information about Livingston visiting his second home in Parsippany resulted in a raid by Loyalists and their subsequent capture. The Loyalist mayor of New York City (and a distant cousin through the Schuyler family), David Mathews, was suspected by being behind the attempted capture of Livingston. The family returned to Liberty Hall in 1779 to begin restoring their looted home. He was elected a Fellow of the American Academy of Arts and Sciences in 1782. Livingston joined the New Jersey Delegation to the 1787 Constitutional Convention in Philadelphia, Pennsylvania and was one of the signers of the Constitution. He was appointed United States Minister to the Netherlands in 1788 by U.S. Congress but turn down the proposition. He continued to be reelected Governor of New Jersey each year until his death in 1790. Livingston (1746–1746), a son who died in infancy. Livingston (1747–1747), another son who died in infancy. Susannah Livingston (1748–1840), who married John Cleves Symmes (1742–1814) in 1780 and became the stepmother-in-law of President William Henry Harrison. Catherine Livingston (1751–1813), who married Matthew Ridley (1746–1789), and later, her cousin John Livingston (1750–1822), son of Robert Livingston. Mary Livingston (b. 1753), who married James Linn in May 1771. William Livingston, Jr. (1754–1817), who married Mary Lennington. Philip Van Brugh Livingston (b. 1755), who died unmarried. Sarah Van Brugh Livingston (1756–1802), who married John Jay (1745–1829) and became First Lady of the United States while Jay served as the President of the Continental Congress from 1778–1779. Henry Brockholst Livingston (1757–1823), an Associate Justice of the Supreme Court of the United States who married 3 times. Judith Livingston (1758–1843), who married John W. Watkins, an attorney. Philip French Livingston (b. 1760), who drowned in the Hackensack River. John Lawrence Livingston (1762–1781), who died at sea aboard the USS Saratoga. Elizabeth Clarkson Livingston (1764–1765), who died young. Livingston died on July 25, 1790 in Elizabeth, New Jersey, and was originally buried at Trinity Church, Manhattan, but on May 7, 1844 was reinterred at Green-Wood Cemetery, Brooklyn. Livingston's daughter, Sarah, was born in 1756 and was educated at home in penmanship, English grammar, the Bible, and classic literature. At a time when women were usually relegated to the kitchen, she was brought up to be politically aware, even serving at times as her father's secretary. Sarah, at the age of 17, married John Jay and became United States First Lady, at the age of 22, while Jay served as the President of the Continental Congress from 1778–1779. Sarah accompanied Jay to Spain and then Paris, where he, along with John Adams, Benjamin Franklin, and Henry Laurens negotiated the Treaty of Paris in 1783. She is credited with writing the celebratory Treaty of Paris dinner toast. When Sarah and John returned to New York, Jay was appointed U.S. Foreign Secretary, and her Parisian training came in handy, as she and her husband established the custom of weekly dinners for the diplomatic corps and other guests in the U.S. capital city of New York. Sarah would go on to serve in her hospitality role as the wife of the first Chief Justice of the United States and First Lady of New York. Among the other prominent descendants of William Livingston were Julia Kean, wife of United States Secretary of State and New York Governor Hamilton Fish, himself a descendant of Peter Stuyvesant, the last Dutch Director-General of New Amsterdam; Edwin Brockholst Livingston, a historian; Henry Brockholst Ledyard, and early Mayor of Detroit. In 1747, Livingston wrote and published a long pastoral poem entitled, "Philosophic Solitude, or the Choice of a Rural Life". One of the first successful original poems written by an American colonist, it was anthologized numerous times into the 19th century. In 1754, Livingston also played a key role in founding the New York Society Library, which is still in existence over a quarter of a millennium later. The township of Livingston, New Jersey was given its name in his honor, as was Governor Livingston High School in Berkeley Heights, New Jersey. The Livingston campus of Rutgers University New Brunswick also was given its name in his honor. ^ a b Livingston, Edwin Brockholst (1910). The Livingstons of Livingston Manor: Being the History of that Branch of the Scottish House of Callendar which Settled in the English Province of New York During the Reign of Charles the Second; and Also Including an Account of Robert Livingston of Albany, "The Nephew," a Settler in the Same Province and His Principal Descendants. New York: The Knickerbocker Press. Retrieved November 16, 2017. ^ a b c d e f Wright, Jr., Robert K. & MacGregor Jr., Morris J. "William Livingston". Soldier-Statesmen of the Constitution. Washington, DC: United States Army Center of Military History. CMH Pub 71-25. ^ "Where Did Alexander Hamilton Live While Attending Grammar School in Elizabethtown, New Jersey? – Discovering Hamilton". Discovering Hamilton. January 22, 2018. Retrieved January 30, 2018. ^ "Book of Members, 1780–2010: Chapter L" (PDF). American Academy of Arts and Sciences. Retrieved July 28, 2014. ^ a b "Susannah French Livingston". womenhistoryblog.com. History of American Women. January 30, 2009. Retrieved November 16, 2017. ^ Hoffman, Samuel Verplanck (1903). Collections of The New-York Historical Society for the Year 1902 | Publication Fund Series. New York: Printed for the Society. p. 91. Retrieved November 16, 2017. ^ "America's Founding Fathers – Delegates to the Constitutional Convention: New Jersey". U.S. National Archives & Records Administration. Archived from the original on June 6, 2016. ^ a b c d e f g h i j k l m Reynolds, Cuyler (1914). Genealogical and Family History of Southern New York and the Hudson River Valley: A Record of the Achievements of Her People in the Making of a Commonwealth and the Building of a Nation. Lewis Historical Publishing Company. pp. 1335–1336. Retrieved November 16, 2017. ^ Rapelje, George (1834). A Narrative of Excursions, Voyages, and Travels, Performed at Different Periods in America, Europe, Asia, and Africa. p. 12. Retrieved November 16, 2017. ^ About Sarah Livingston Jay. Accessed October 13, 2014. ^ Society, Chicago Medical (1922). History of medicine and surgery and physicians and surgeons of Chicago, endorsed by and published under the supervision of the council of the Chicago Medical Society. The Biographical Publishing Corporation. Retrieved April 26, 2017. ^ About Livingston Archived July 27, 2011, at the Wayback Machine. Accessed March 9, 2007. United States Congress. "William Livingston (id: L000374)". Biographical Directory of the United States Congress. "Livingston, William" . Encyclopædia Britannica. 16 (11th ed.). 1911. p. 813.